I had never heard of egg custard pie before, let alone eaten one. Thank god for Pinterest or I might have never, ever known about it. Then where would we be? Not eating this awesome pie, that's where...probably crying in a corner or just like sitting there all catatonic. Thank goodness we will never have to find out because I found this recipe. Now my world is filled with custard and my heart is full of songs. If there are eggs in a recipe at this point, I'm all over it. My chickens' eggs are just the best and I am always proud to use them. 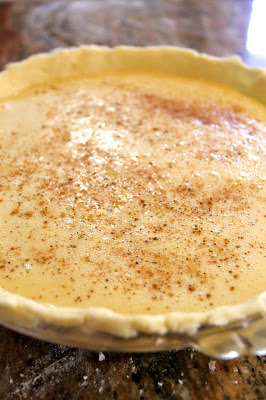 After trying this egg custard pie, I foresee a lot of egg custard in my future. I did make one change to the recipe, and that was not using milk. Instead I used almond milk. I'm a rebel. THEN, after it was made, and looking all wonderfully and stuff, a friend of mine suggested adding coconut to it...which I couldn't do because like I said, it was already done. However, I totally plan on working with this recipe and coming up with a coconutty love child version of it. Oh, and for a moment here, let's talk about the bake time. Because sometimes I think that my oven is just wack. It always seems to take me longer in my oven than the recipes say it should. But it could also be the recipes....right? Not everyone tests their recipes, and I know this for a fact. No matter... I also used a deeper pie pan than the recipe, so it could have been that too. As ever, I am a Jiffy Crust gal. It's just the easiest way for me to get crust at a low price. But you can use a frozen crust or even make it from scratch. Depends on how you roll, I guess. 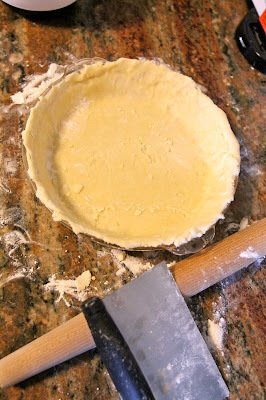 Either way, once you get your crust into the pie plate, you will want to poke it with a fork all over. I like to use those moments to get out my aggression. Then you are going to brush it with egg whites. Here I have three whole eggs and one yolk. See how yellow they are? Happy chickens = yellow yolks. Adding my almond milk, which is a change from the original recipe. Living on the edge, what can I say? There is sugar and vanilla in there too. And whisk it good. Whisk it REAL good. Then you have to let it cool and you've got a pie that is custardy and eggy and just perfect if you ask me. This is a great last minute pie....like, you know, when you want a pie just when you want it and not all planned out and stuff. Which for me is always. CLICK HERE for the recipe to this amazing Egg Custard!